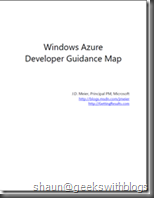 Well now I’m busy with preparing my session about the Windows Azure AppFabric on TechED 2010 China, one of my colleagues Chen Pu told me that the new Azure Developer Portal was released last midnight. Then I just closed my session presentation and have a look on this new webiste. I had seen it before in the PDC10 videos and knew that it will be more quickly and user-friendly. Now let’s take a look on what it is. 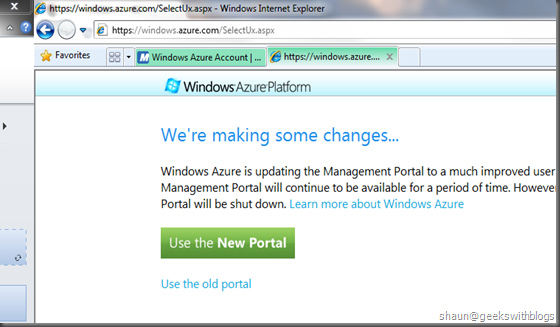 When you log on the development portal of Windows Azure, SQL azure or AppFabric, there will be a section page where you can choose to log into the new fancy portal or the old poor one. The whole website was built by Silverligh. That means it provides very good user experience. So let’s have a look on some key sections/features we are familiar with before, to see how it become in the new style. 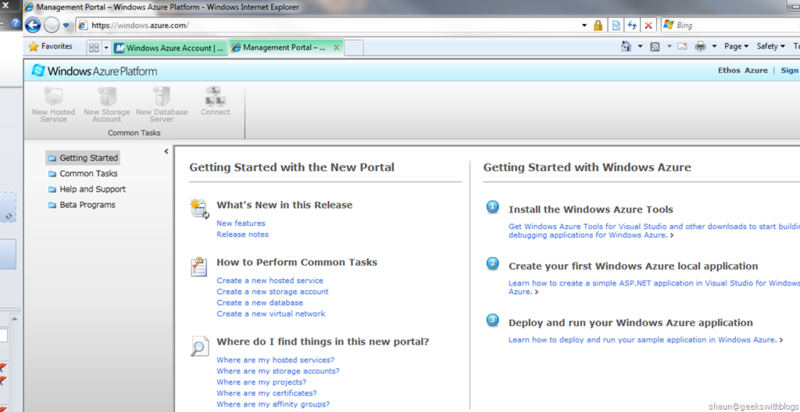 First of all is the Windows Azure Services Management. As we can see all the hosted services, slots and instances are listed on the main grid. 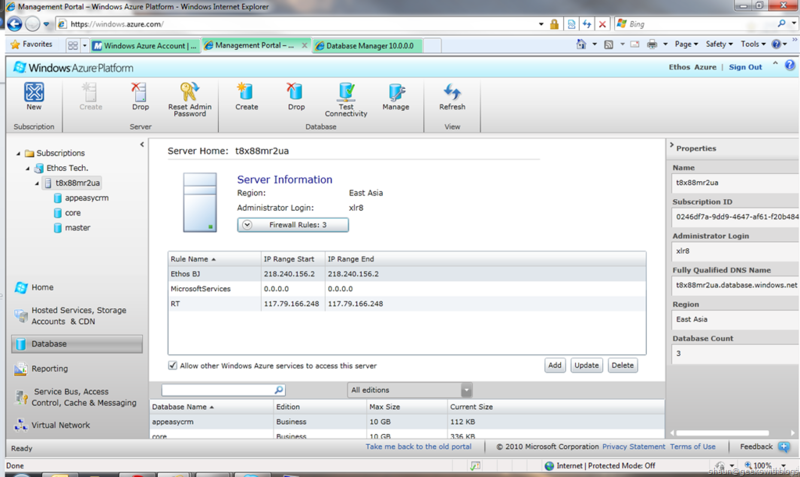 And the additional information was on the right hand side such as the name, URL and deployment ID, etc. 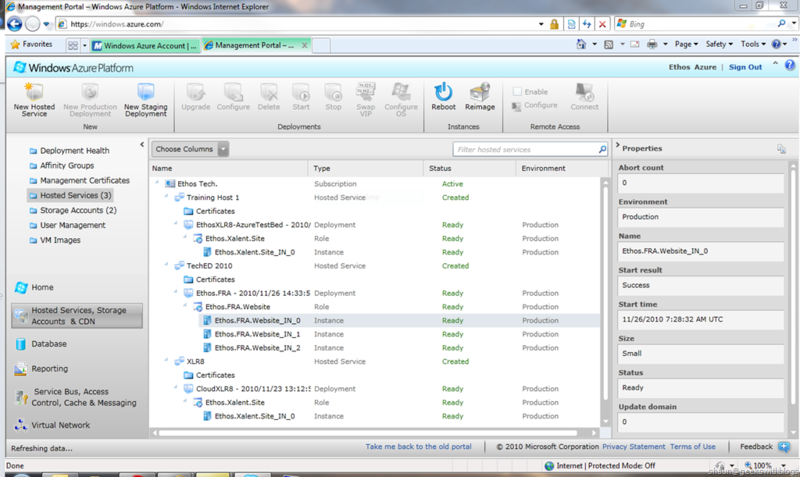 And on the top tool bar there are the commands we can use such as Upgrad, Stop, Start, Change Config, etc. 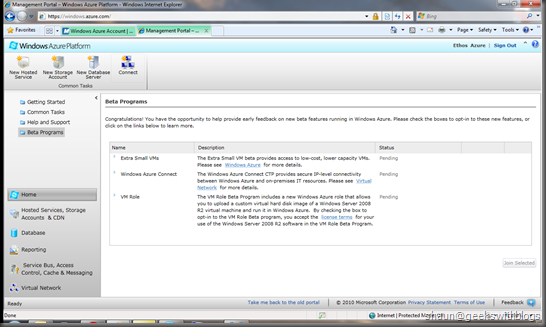 And there are some new features in this release: Reboot, Reimage and Remote Desktop. 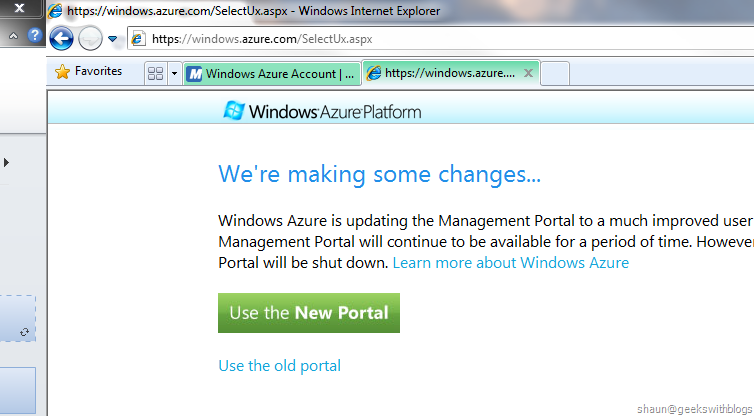 Next is the new SQL Azure portal. 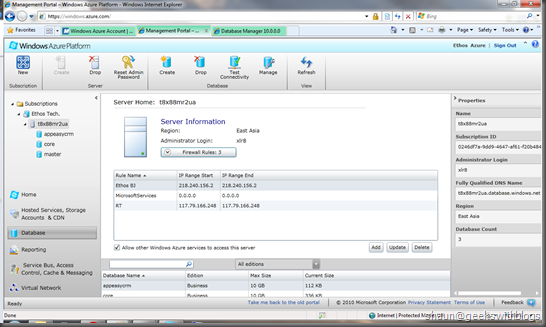 Just click the Database menu in the bottom left panel. 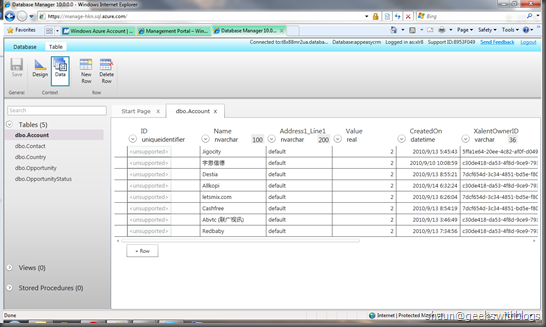 One of the cool thing is that, when we click the Manage button it will bring the Hoston, a web-based SQL Azure Management Application, to us. And then, some other features that available within this new release. We can add some Co-Admin of the azure project. Also there are some Beta Programs we can apply to use. 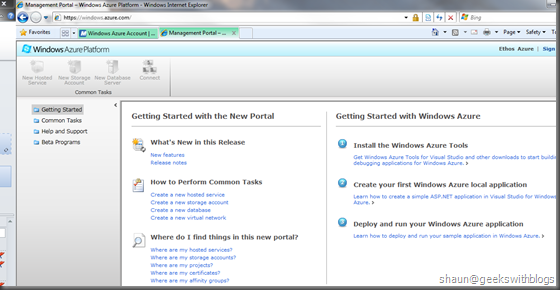 For more details about is new portal here is the help on MSDN. Also the new SDK 1.3 was available as well we can download here. The new protal and SDK 1.3 was mentioned in the PDC10 at first. After a very quick overview I think the user experience and performance improved a lot. And it brings a lot of new feature to us. Most of them give us more power to control the actual runnning virtual machines. In the short future I’m going to introduce some key new features avaiable in the new SDK 1.3. 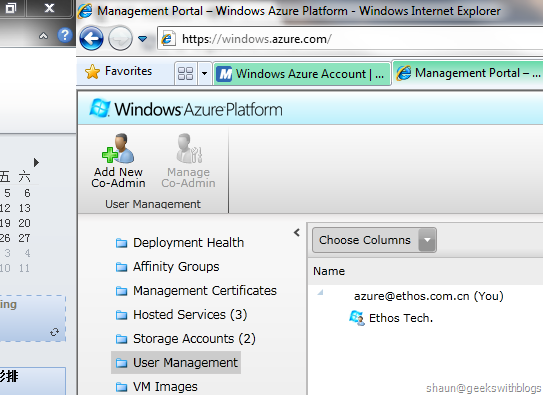 As you know I’m working in Ethos as an architecture and azure expert. 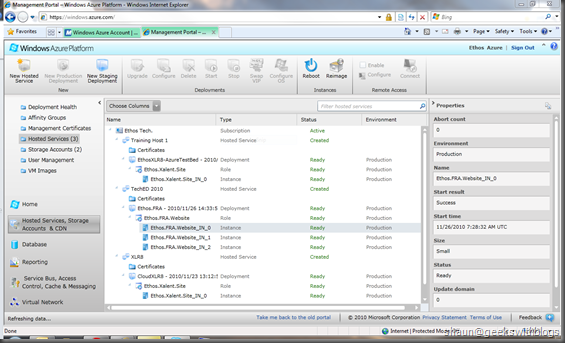 Our company will arrange an azure training plus hands-on labs in December in Beijing office. And I will be one of the trainer which would be very existing. If you are in Beijing and can undersand Chinese (we will use Chinese in the training) and more important, if you are intrested in Azure just like me, please find the training details as follows. The training fee is 300RMB with the seats, computers and dinner. In order ensure the training quality the size of the training would be no more than 15 people so register as soon as you can! 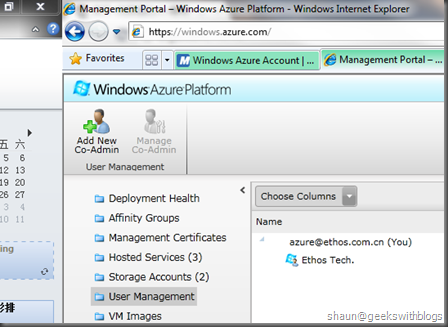 Ethos (www.ethos.com.cn), a leading consulting and solution provider in cloud and social field, is offering a 3-day evening course on Microsoft Azure. Date of event: December 8, 10, and 14. 6:30-9p.m. 2. Strong passion on new technologies like cloud computing and Dynamics CRM2011 . 3. Good communication skills in both Chinese and English. Interested attendees, please contact tianli@ethos.com.cn for more details. 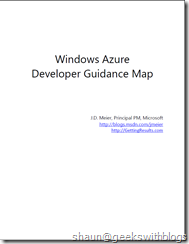 Lead developer of the first economical azure project in europe. Consultant for UFIDA Chanjet azure migration project. Architect of the XLR8 cloud computing platform project.